Shop at Cheap Cycle Parts, online at CheapCycleParts.com, for all of your motorcycle needs. This store offers customers apparel, including casual, eyewear, footwear, gloves, helmets, and riding gear; aftermarket parts, including body, brakes, control, drive, electrical, engine, exhuast, fuel & air, seats, suspension, and windshield; OEM parts, including Honda, Kawasaki, Polaris, Suzuki, and Yamaha; tires and wheels; and a large assortment of accessories. Hurry over and start shopping now, and check out RetailSteal.com for amazing Cheap Cycle Parts savings, Cheap Cycle Parts deals, and Cheap Cycle Parts codes. Shop online at CheapCycleParts.com and save up to 60% off cycle parts and gear. Hurry over to Cheap Cycle Parts and receive up to 50% savings on select icon apparel. Save over 30% off during the Adventure Sale at Cheap Cycle Parts. Click link to shop online. 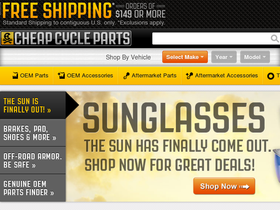 Shop rivet links and find prices as low as $1.95 at Cheap Cycle Parts. Shop Metzeler Lasertec bias sport touring at Cheap Cycle Parts and spend only $108.73 on your purchase. Shop at Cheap Cycle Parts and find Moose Racing complete gasket set with oil seals for the low price of only $140.95.